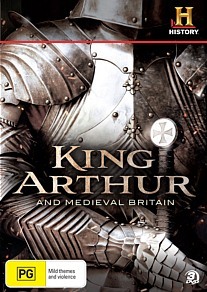 King Arthur and Medieval Britain DVD Review. We could happily recommend this collection to all history buffs and for those who have fallen in love with the legend. This two disc collection goes into some depth regarding the legend and history of King Arthur and the Knights of the Round Table plus the legendary Holy Grail of Christ. Best of all, this documentary explains both the facts and the romanticising of the legend which gives the viewer a unique insight into whether this 6th-century King existed. From expert interviews to professional re-enactments, King Arthur and Medieval Britain also gives the viewer a unique insight into how people may have lived during this time and to what inspired these legends to be born and shaped the ideologies of chivalry. It's also quite interesting that the producers of this collection show both sides of controversy of whether King Arthur existed or was it like the other mythical hero, Robin Hood. Interestingly enough, the first mention of King Arthur as a King was published in the 12th century by Geoffrey of Monmouth. The only drawback from this DVD is that quite a few of the documentaries collected go over similar ground so watching it from start to finish is probably not the best idea. The first episode Quest for King Arthur explains the search for this legendary King as the viewer is taken through a history lesson as the producers attempt to piece together this enigmatic romantic legend such as the various scrips and manuscripts that are highlighted in this episode like 1170 A.D. poem by Chrétien de Troye. Although most episodes re-touch the main themes of Arthur, there are some interesting themes like that of the Holy Grail, Camelot and the Knights of the Round Table. Knights and Armor is more about the evolution of armour as opposed to a history lesson on King Arthur but it's a great insight into the life and times of medieval England. All in all, King Arthur and Medieval Britain is an enjoyable collection of documentaries regarding the myth and the man. It is professional presented and narrated well with one episode featuring Patrick Stewart. As the series is backed up with experts that link the myth to actual events thanks to the Arthurian texts that have been written throughout history. The interviews are informative and the re-enactments help recreate this romantic era of the birth of one of Britain's most legendary characters... King Arthur. We could happily recommend this collection to all history buffs and for those who have fallen in love with the legend.